White Fang is a 1991 American Northern adventure drama film directed by Randal Kleiser, starring Ethan Hawke, Klaus Maria Brandauer and Seymour Cassel. Based on Jack London's novel White Fang, it tells the story of the friendship between a young Klondike gold prospector and a wolfdog. White Fang is portrayed by a wolfdog, Jed, who also appeared in such films as The Thing (1982) and The Journey of Natty Gann (1985). A sequel to the film, White Fang 2: Myth of the White Wolf, was released in 1994. In the late 19th Century, a young explorer named Jack Conroy arrives in Alaska from San Francisco to look for his deceased father's mining claim. Conroy meets tow mushers named Clarence "Skunker" Thurston and Alex Larson, Conroy's father's buddy, who reluctantly agree to guide Jack to his father's claim in the Yukon. While on their journey, they are stalked by a large pack of wolves. One night, while resting at a campfire, a female wolf named Kiche manages to lure one of the sled dogs (Digger) away from the group, and another wolf appears and chases the dog into the woods. Skunker uses his ammunition to wound Kiche and gives chase to save his dog, but is killed and devoured by the rest of the pack. Later that night the wolves return but are scared off by Jack and Alex using burning branches. The following morning the wolves attack the two men, but they are saved when another sled team arrives with one of the men fatally shooting a male wolf. The injured wolf hobbles back to her den, and her cub remains by her side until she dies. The pup is left to fend for himself. Jack and Alex reach a town where they plan to stay for the winter. A band of Native Americans, meanwhile, find the pup, and the chief, realizing he is not a (full) wolf from the color of his teeth, names him White Fang. As spring comes, Jack and Alex resume their quest, but stop off at the Native Americans' settlement. The chief explains that White Fang has been raised to obey, not to be friendly, but Jack seeks to change that. Jack's chance comes when he is chased and cornered by a grizzly bear. White Fang intervenes, saving Jack's life. Jack and Alex later leave the settlement. Not long after, White Fang is unfairly traded to a brutal dogfighter named Beauty Smith (who previously stole Jack's money); he blackmails the Native American for the wolfdog, saying that ownership of a wild animal is considered illegal. Smith and his gang train White Fang to be vicious in order to enter him into illegal dogfights. White Fang eventually meets his match in a brutal fight against a bulldog, but Jack happens upon the fight and intervenes in the nick of time. Having earlier reached his father's claim and begun the work of digging for gold, Jack returns with White Fang to the cabin where he seeks to transform White Fang's vicious and territorial nature. Jack's attempts to tame White Fang eventually succeed; both wolfdog and man develop a close and trusting bond. Alex helps Jack mine for gold and they strike it rich with the help of White Fang. 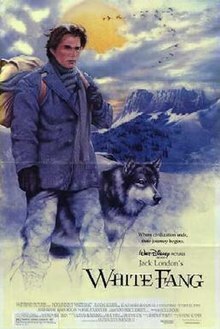 One morning, Jack travels to the town to claim proper ownership to the gold when Luke notices White Fang with him. Seeking retaliation and planning to steal the gold, Smith and his men attack the cabin site. White Fang attacks Tinker, who accidentally discharges his gun, wounding Luke. White Fang subdues Smith until he's ordered by Jack to back down. Jack and Alex take Smith and his men prisoner and force them at gunpoint to haul gold ore into town. Alex and his wife, Belinda, offer to take Jack back to San Francisco, but he lets Jack know that city life is no place for a wolf; he must let White Fang run free in the wild. Though White Fang cannot understand why Jack is trying to leave him, Jack's efforts by using a stick (which White Fang hated/feared when he was under Smith) finally succeed in scaring the wolfdog off. Later, just as he's boarding the ship back to San Francisco, Jack realizes that his rightful place is in the Yukon and he decides to stay behind alone and live off the land; Alex congratulates him by saying that it is what Jack's father would have wanted. After a short time, White Fang returns to the cabin site where he and Jack are happily reunited. The film received generally positive reviews, with a 63% "Fresh" rating on the review aggregator Rotten Tomatoes. Film critic Roger Ebert, giving the film three stars out of four, described it as a film that "holds the natural world in wonder and awe", and praised the actors' "authentic and understated" performances. The film produced on a budget of $14,000,000 grossed $34,793,160 in North America. The film was also a particularly large box office hit in France where it had 3,501,373 admissions becoming the 4th highest earning film of 1991. White Fang was released on VHS and Laserdisc on June 12, 1991, then released again for the 1992 re-releases and onto DVD on April 23, 2002. Genesis Award for Feature Film – Family in 1993. ^ a b "White Fang (1991)". Box Office Mojo. Retrieved 2010-03-20. ^ "Jed". IMDb. Retrieved 2018-01-16. ^ "WHITE FANG | Movieguide | The Family Guide to Movie Reviews". Movieguide. 1991-01-18. Retrieved 2013-12-30. ^ "White Fang (1991)". Rotten Tomatoes. Retrieved 2009-12-27. ^ Ebert, Roger (January 18, 1991). "White Fang". Chicago Sun-Times. Retrieved 2009-12-27. ^ JP (1991-10-16). "White Fang (1991)". JPBox-Office. Retrieved 2013-12-30.